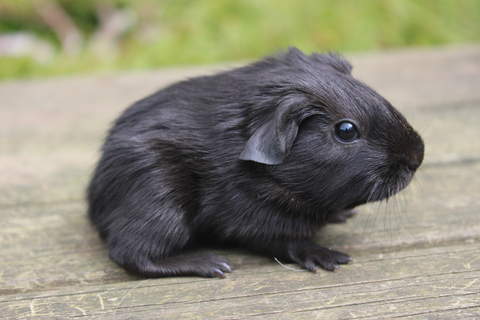 A smooth coated guinea pig of all one colour is known as a Self. They come in a multitude of colours, black, red, cream, white, golden, lilac, chocolate to name a few. Each colour is referred to as a separate breed, and within each colour they may also be identified by their eye colour, e.g. the pink-eyed white, and the dark-eyed white. However there is interbreeding between the colours due to the genetics of the colour genes, e.g. A buff * white mating will produce all creams, whereas a cream * cream mating will produce 50% cream, 25% buff and 25% white! The top colour is an even shade across the body, with the under colour slightly paler. All Selfs have flat faces with broad roman noses. 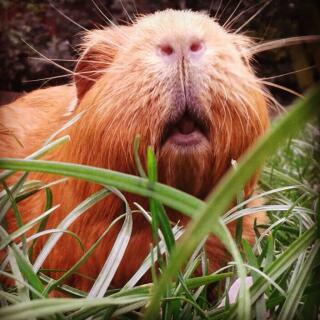 Having kept piggies for more than 10 years now, I have found that my pedigree girls tend to be the healthiest. Previously had 3 boars, all lived together very well, little to no scrapping! Had a few ailments which I treated holistically, don't like POM's unless absolutely necessary. All my piggies are house piggies, Cream selfs are beautiful to look at, Cooks (Cookie) is now well over 5 years old and her fur is still full and soft. She grunts, squeaks, jumps for joy still abundent. If anyone wants to breed , be warned do this almost as soon as you bring them home, they have one of the longest gestation periods (70 days in some cases) for a small critter and the sow pelvis fuses at approx 12 months making birth impossible. Handle them well daily and they wont be too shy after all these are prey animals. I love watching them walk around almost tutting to themselves ( 'but, but but' I think). And when the food cupboard door opens - it's a full on 'Squeak'! Whilst guarding the food bowl! 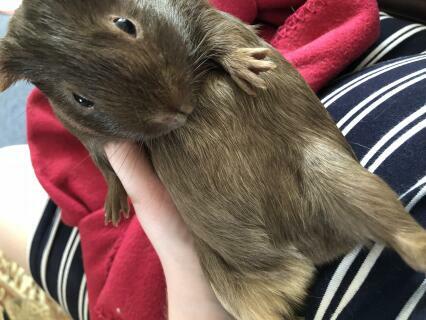 I got a little chocolate brown one now and its only a week old and as soon as i brought it home it lan onto my hand and fell asleep it wass soo sweet and now im getting another one to keep it company im going to get a male soo my male and female will have babies because their soo sweet i could have all the guinea pigs in the world i just cant take my eyes of them plus its been accepted to be in a compitition like shez gonna win first place deffinetly.